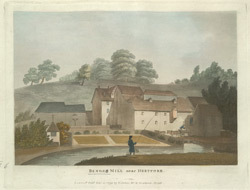 View of Bengeo Mill in Hertfordshire. Because of the large number of rivers in Hertfordshire there have been many types of milling activity here, the most predominant being flour milling from corn. Hertfordshire has long been known for producing’ Herts White’ a certain type of bread. The bread would have transported to London by barge. Hertfordshire has also been described as the birth place of the paper making industry and as early as the 1490s paper was supplied from here to the crown.